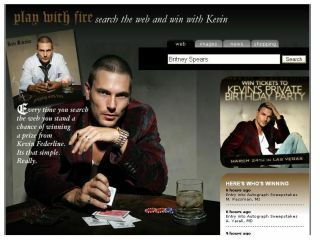 If you're having trouble finding something online, perhaps Britney Spears' ex and pop-star wannabe Kevin Federline can help. The aspiring rapper has launched an internet search engine, SearchWithKevin.com , branded to the roots with his K-Fed persona. Those using the search engine have the opportunity to win an array of highly desirable K-Fed prizes, such as his album, t-shirts and other signed paraphernalia. Typically, this is a PR exercise to promote Federline's newly released album, Play With Fire. The site was created by Prodégé, a company that creates tailored Yahoo-powered search engines for "record labels, brands, non-profit organisations and lifestyle companies". You can also search the web with Meatloaf, plus z-list celebs Andrew Dice Clay, Relapse, Wynnona and Hinder. Britney Spears famously dumped Federline by text message last year. Perhaps he should use his own search engine to search for a lovematch, preferably one with more hair.